This post is part of the Telegraph Avenue pre-publication readalong, hosted by As the Crowe Flies (and Reads). For more information about the book, the readalong, and to find others' thoughts on the reading so far, visit the As the Crow Flies (and Reads) main readalong post for this week. "At 9:45 A.M. the first batch of chicken parts sank, to the sound of applause, into the pig fat. The fat set about its great work, coaxing that beautiful Maillard reaction out of the seasoned flour, the smell of golden brownness mingling with the warm, dense, bay-leafy, somehow bodily funk of the beans, and with the summertime sourness of the greens like the memory of with Keds stained at the toes with fresh-cut grass. Nat stepped through the time portal that reached within the ring of seasoned iron. Riding the kitchen time machine." It is the beauty of these wonderfully crafted sentences, I think, that ultimately carries Chabon's story--he uses words in the most precise and careful way to illuminate what is most important. Here, it is the power of food to bring back a memory, and not just a specific memory, but an entire bank of memories, of a time, and a place, and a person, and a feeling. His descriptions elevate the food beyond food and into the realm of the surreal; Nat's fried chicken is not just a meal, but an invitation. "'I'm sorry,' Gwen said again, and this time it was not an expression of regret for the things she had said or done but rather the opposite: Her apology was, as apologies so often are, fighting words. She was sorry only that she was not sorry at all." The simplicity of the statement is overwhelming; though Nat sees apologies as "a miracle of language. Cost you nothing and returned so richly," to Gwen, they are an impossibility. Nat is a white man, and can make mistakes and apologize for them; Gwen is a black woman, and cannot afford to make mistakes--nor apologize where no mistake was made. 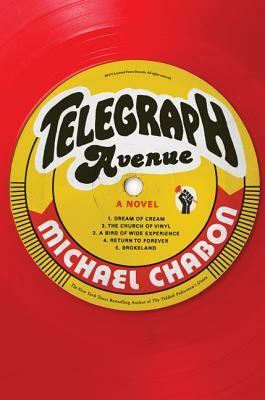 Telegraph Avenue is proving to be a successful novel, thus far; Chabon has brought together the meta-issues of race, poverty, death and family into a cohesive, solid novel that is clipping along at a steady pace, now that I've figured out everyone's nicknames. "Pausing at the top of a fold-down stair for a display of freestyle looming, brother looked like a celebrity golfer or as if perhaps he had recently eaten a celebrity golfer." I was saddened to read of Cochise's sudden death, and surprised to find the unexpected Senator Obama on the pages (not sure I completely loved that, to be honest); I'm excited to move on to Parts III and IV and watch the story fully develop; to see Archy and Titus finally interact; to fit Luther Stallings into the puzzle of Dogpile Thang; to reassemble the broken pieces of Archy and Nat's friendship. *I'm not sure one actually can modify the "hook, line and sinker" saying to "hooked, line and sinker" like I did just there. NPR.org: Why Vinyl Sounds Better than CD, or Not. Note: Thanks to the publisher for providing advance copies of this title for readalong participants. I love your analysis of Gwen's apology. Besides Julie, she's probably my favorite. There's so many layers to her, so much going on that's just so real. I can't help but root for her. Right? I just want something to work out for her. Even if it's just one thing. I noted the differences in the two worldviews on apologies, but I'm ashamed that I didn't take the analysis a step further like you did and apply race & circumstance to the differences. Nothing to be ashamed about! I might well have read too much into it. I was just really struck by how differently they approached their mistakes. Kerry, I too admire Chabon's insights and stylistic choices in the passages you cite here. Personally, though, I found his prose stylings quite uneven in the first section, much more congruent and effective in this part. I'm going to miss Cochise Jones, and I suspect that's a deft maneuver on Chabon's part so that I feel empathy with Archy on the loss of a wise father-figure. I sure hope he hops off that Dogpile (although I suspect that the opposite choice may thicken the plot). And I agree with Emily and Nicole: Your analysis of power and race as they affect apology is dead on, and I thank you for it. It took me the better part of Part I to figure out who Cochise was and how he fit into the story, but I'm definitely going to miss him, too. Glad the analysis of the apology rang true with you, too. I'm looking forward to some kind of showdown between Archy and Titus, too. That's where the real drama of the book is for me. I'm less concerned about the store, I guess! I just want to see the two interact - on any level! So far, they've existed on the periphery of each others' lives... should be interesting. I struggled with this section a bit. I didn't like the Obama appearance, and I got a bit tired of Archy by the end. I was ready to spend more time back with Gwen and Aviva. I actually don't mind Archy, despite his (numerous) blunders and errors. I feel like he kind of can't help himself. I think we are going to end up with a lot of confrontations in the back half of this book - Archy and Nat, Archy and Gwen, Archy and Titus, Gwen and Aviva with the hospital, and the record store against the Dogpile. I'm interested to see where things end up! Definitely! There is a lot teed (spelling?) up at this point... looking forward to Parts III and IV to see if it starts to come to a head or if it's more build-up before Part V.